Modern Japanese Dishes & Desserts! I have always had the perception that Nana’s Green Tea is a dessert house. That is until a recent visit to Nana’s Green Tea that I had discovered that they also serve a solid list of modern Japanese dishes besides their awesome signatures of desserts. Nana’s Green Tea was the brainchild of Kazuto Kutami, who took on the challenge of revolution of the F&B scene and came up with the thoughts of preserving the Japanese tea culture through a modern inspiration. Green tea has always been Japan’s pride and joy, so it was really only sensible to run the concept on green tea inspired desserts and beverages. With nearly 80 outlets in Japan, Nana’s Green Tea has truly become a favorite among the young and the old in the country. 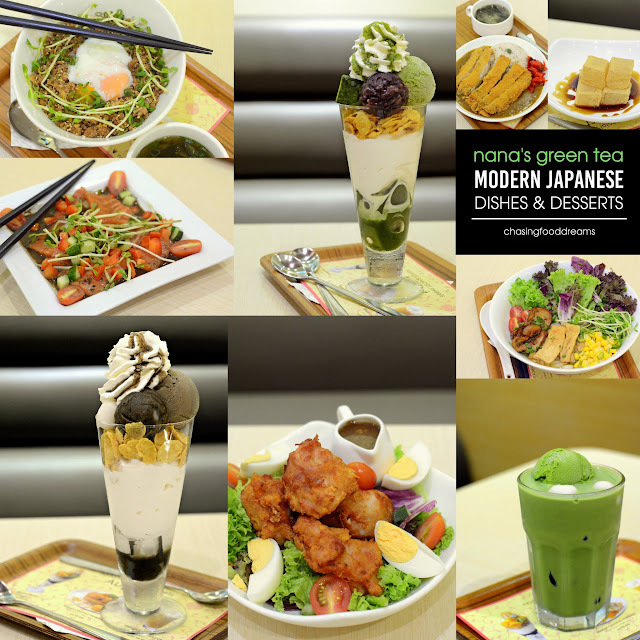 The first Nana’s Green Tea in Malaysia opened in April 2014 at Mid Valley City and today, there are 3 outlets located in Mid Valley, One Utama and Pavilion Kuala Lumpur. Managing Director Ms. Valerie was inspired on her trips to Japan and decided to bring Nana’s Green Tea to our Malaysian shores. We are glad she did because Nana’s Green Tea serves some of the most awesome green tea dishes and beverages. We visited the One Utama outlet which is located quite discreetly between the old and new wing link path. Nana’s Green Tea is housed in a spacious outlet with two levels of dining. Choose the al fresco dining level or the upper level for a comfortable dining. The ambience is decorated in warm and neutral tones in lots of light wood. The ceiling of the upper level is constructed by the inspiration of a hand held fan and lots of mini egg-lites for a subtle glow. There are plenty of Japanese Sampuru or plastic food displays at the front of the restaurant to tempt diners! I was impressed at the menu of Nana’s Green Tea as there are some really gorgeous lists of dishes as well as the mind-boggling and beautifully organized beverages and desserts. Of course, most of the menu revolved around green tea but if you really are not a fan, there are also non-tea dishes, beverages and desserts. Matcha Soft Cream Latte (RM14.90) and Hoji Kuromitsu Latte (RM12.60, served hot, are so delicious! The intensity of the matcha in Matcha Soft Cream is just right, powerful and yet not overwhelming with creamy luscious notes. The roasted green tea in Hoji Kuromitsu Latte was also rich and has an additional earthy warm note to the additional of green tea flavours and black sugar syrup. If you love the ice blended versions, go for their slushy variations. Our Matcha Kanten Slushy (RM11.50) and Matcha Kuromitsu Slushy (RM11.50) was icy and refreshing. The Kanten, or a type of agar derived from red seaweed, is very good in texture and flavours. It is quite firm and yet has a good feel texture with solid green tea flavour. The Kanten was the highlight of the drink for me. The Matcha Kuromitsu Slushy had the addition of the Japanese black syrup which resembles a rich molasses but less heavier. Matcha Azuki Shiratama Latte (RM14.90) would be another good choice if you love Shiratama. These cute little sweet rice flour dumplings are lightly soft and chewy. The latte is creamy with good flavours of green tea and bits of creamy red bean. If you are a real tea connoisseur, then you should definitely go for Nana’s Green Tea Uji Matcha (RM18.50)! It’s such an indulgence of bittersweet intense green tea with such refine and elegant note. As we watch our server carefully stir the green tea powder into the warm water and whisked it gracefully, a bright rich green tea color appeared with a layer of creamy froth. Such artistry all for the sake of a cup of warm and delicious Uji Matcha. Moving on meals, the menu here features trendy Japanese dishes that also has much warmness incorporated for a light, healthy and delicious meal. Catered to all diners at all ages, there is really something for everyone. We started with Salmon Carpaccio (RM18.40), where pieces of salmon are sliced thinly and served with a tangy vinaigrette dressing together with fresh bell peppers, cherry tomatoes, cucumbers and pea sprouts. A decent appetizer to kick off any meal. The Chicken Karaage Salad (RM16.00) is very drool-worthy with big chunks of Japanese battered boneless fried chicken served with greens, boiled egg, tomatoes and tangy dressing. High points goes to the juicy and flavorful crispy fried chicken as it is such a well-made one. Using boneless chicken thighs, the fried chicken is also tender. Moving on to heavier dishes, we had the Seafood Mentaiko Udon with Cream Sauce (RM33.60). One simply must enjoy this dish piping hot as the rich pink cream sauce gets too heavy when it is cold. When it is hot, the chewy udon goes so well with the saltish mentaiko cream sauce that also comes with scallops and prawns. Leaning towards the simple and comforting angle is the Wakame Tamago Udon (RM18.40). This healthy dish has udon in seaweed broth, lots of seaweeds and a poached egg. Its really simple but flavour are so good and soothing. For a Western touch, there is also the Locomoco Hamburg (RM23.90). A thick patty of chicken hamburg is smothered with a moreish and savory brown sauce. Served with options of rice and some vegetables and egg, the dish also comes with a side bowl of soup. I enjoyed the juick hamburg patty but thought the sauce was a tad too salty for me. However, when savored with the rice, the sauce seemed to be alright in taste. Tori Soboro Don (RM19.60) also proved to be another comfort dish that one can enjoy on daily basis. This one reminds me of my younger childhood meal where mom used to make with minced meat and egg. Minced chicken, lots of sesame seed, pea sprouts and soft boiled egg on rice is a healthy and perfectly nutritional meal on its own. Once the egg is stirred into the rice, it helped to sauce the whole dish and bring the meat and rice together. Yum! Nana’s Green Tea Lunch sets are quite a treat as they are priced at RM21.90 which includes a main course from the selected lunch menu and a beverage from Set Drinks. This is available during weekday from 10am to 5pm and weekends & public holidays from 10am to 3pm. We tried three choices of their lunch set dishes. First one is their best seller, the Chicken Nanban. Crispy fried chicken cutlet is topped with a luscious mayo based sauce. It is served with white rice or millet rice (add on RM4.50), Japanese potato salad and some vegetables. This dish is sufficient for heavy eaters and is quite a filler, especially during lunch but many will be glad as the dish is easy and delicious to enjoy. The Kitsune Udon has such pretty colors all on a bowl of udon with chilled broth. Lots of fresh purple and green lettuce with pea sprouts, corn, grilled eggplant, cherry tomatoes and bean curd puff gave this dish a delicate and fresh note. I personally really enjoyed this chilled udon with vegetables as there are lots of different flavours and textures in the dish. It also won’t leave one with a heavy feeling when they return to work after the meal. Japanese curry lovers will enjoy the Chicken Cutlet Curry, another generous portion of crumbed and fried chicken cutlet served with white rice, Japanese curry sauce and pickled vegetable with a side of soup. I do enjoy the Japanese curry sauce as it is not sweet and leaned towards savory with just the right balance of spices. There is always a monthly promotion featuring special dishes and desserts of the month. While I was there, there was the August Promotion featuring a Sweet & Sour Fish. Crispy chunks of lightly battered fish is tossed with the Japanese version of tangy vinegary based sweet and sour sauce with mushrooms and peppers. These are served with millet rice, Japanese styled rolled omelette, boiled sweet pumpkin and soup. It’s not like our usual classic sweet and sour but I still enjoy the dish as it had home cooked soothing tangy flavours. Another August Promotion treat not to be missed is the Tropical Parfait (RM23.10). This one is divine and just so darn scrumptious. The long list of ingredients that made up the parfait includes coconut pudding, read bean porridge, vanilla soft cream, corn flakes, coconut ice cream, mango sorbet, fresh mango and kiwi and cream. I literally wanted to hog this to myself as the combination is so good. I did feedback to Nana’s Green Tea to try and put this on the regular menu as it is such a gorgeous dessert! Other parfaits we tried from their regular menu are their signatures of Matcha Nama Chocolat Parfait (RM23.10) and Hoji Gateaux Chocolat Parfait (RM23.10). it was a tough a decision on deciding which one was my favorite as both were also good on their own flavours. From layers of Kanten green tea jelly to vanilla soft cream, red bean, cornflakes, green tea ice cream and Nama green tea together with whipped cream and green tea sauce, it was certainly fun digging into this tall parfait. The choclat version similar ingredients but is chocolate instead of green tea. Instead of Nama choclate, there is Shiratama balls and two scoops of chocolate ice cream and sorbet. Digging into the parfait is like unwrapping presents as one get to unveal and taste the different layers of textures and flavours in the parfait. Kinako Warabimochi (RM17.20) came highly recommended and we can understand why after we had a taste. The mocha is coated with kinako, a sweet toasted soybean powder. Simply drizzled the Kuromitsu syrup over the mocha and savor. The texture of the mocha is delightful and lightly bouncy. There is a nutty element of taste in the dessert while the black honey syrup added more richness to the dessert. After savoring Nana’s Green Tea, I find myself wondering when I can be back to savor more treats. While the meal is decent and delicious, it was really the beverages and desserts that truly won our hearts. There are plenty of reasons to visit Nana’s Green Tea and even if you don’t think you have one, Nana’s Green Tea is still worth a try… who knows, you may be hook just like me! sieht toll aus, schöne Farbe und lecker, sehr anders mit einem Twist grünen Tee und das Dämpfen ist eine großartige innovative Idee !!! schönes Geburtstagsgeschenk für Priya! sicher wird sie es lieben !! !